In 2017, NS will continue on the course previously set. There will be a clear focus on performance on the main rail network, including the HSL, the door-to-door journey and world-class stations. 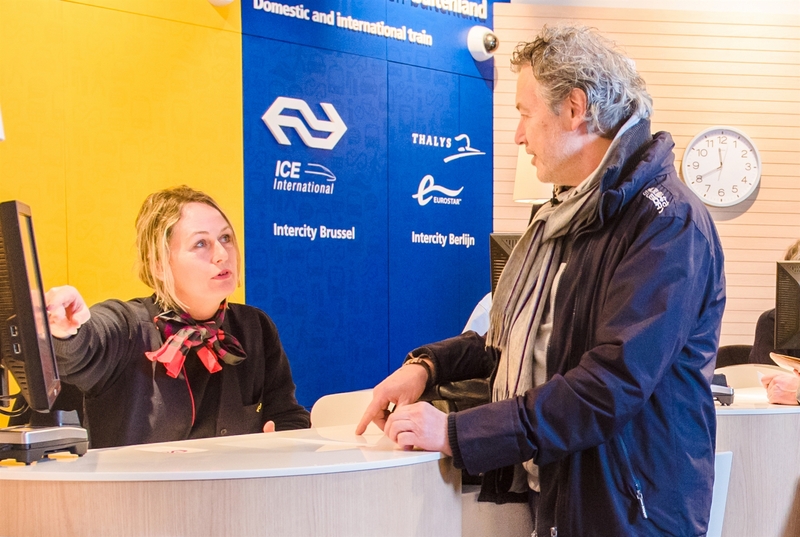 Together with our partners, we will continue to improve train travel. By focusing on the three core activities, we will genuinely be prioritising passengers and we will be further fleshing out our role in society of strengthening sustainable mobility in the Netherlands. The mid-term review of the main rail network franchise is due in 2019, when the government will assess whether NS has achieved the agreed targets for the performance indicators for 2019. In the new strategy, we will be making choices aimed at making real improvements in our performance. These improvements, initiated in 2016 and continued in 2017, should have a noticeable effect for passengers. Since 1 January 2017, our electric trains in the Netherlands have been running completely on green power. That is a milestone not just for our company but also for Dutch society. By making mobility greener, we are helping the country achieve the UN’s climate targets. The energy used at stations and NS offices in the Netherlands will also be completely ‘green’ by 2017. Our trains will not only be green in 2017, they will also increasingly be new or modernised. The 58 ‘Flirt’ type Sprinter trains are being introduced in the timetable in phases, starting in December 2016, and are therefore becoming an increasingly familiar sight in the Dutch landscape. This will be followed by the introduction of 118 CAF Sprinter trains. The first modernised VIRM-1 type double-decker trains will start running on Dutch track in 2017 too. A total of 81 trains with 416 coaches are undergoing upgrades. Sustainability is an important aspect here: some elements, such as the cab and vestibule, are reused as much as possible. The upgrades will take until 2020. NS expects to be able to introduce 79 new single-decker Intercity trains as of the 2021 timetable. These trains, with a total of 25,000 seats, can run on both the regular network and the HSL. We aim to make travelling with NS a more pleasurable experience not just with new trains but also with new services. For example, in the coming year we will be continuing with the development of travelling on account, we will be testing the improved ticket machines and we will start accepting payments by credit card. We will also be extending the NS Extra programme and offering the option for queries of chatting with an NS employee via ns.nl. In the course of the year, we will be expanding the options for the information screens in trains, for example including specific information on disruptions. NS has carried out a trial at the Bilthoven and Heerenveen stations with self-service bicycle storage facilities including such features as access using your bank card or public transport smartcard and offering public transport bicycles (OV-fiets). If the trial is a success, we will roll the concept out at additional stations in 2017 and 2018. We will also be buying at least 1,000 new public transport bicycles a year for the next three years. The refurbished stations of Eindhoven and Tilburg will be reopened in the coming year. A great deal of work on the track is planned for 2017, particularly on busy routes in the Randstad conurbation. Unfortunately that results in more disruption for our passengers. The work is necessary because ProRail has to maintain the infrastructure and prepare the track for future demands. NS is talking to ProRail about better and more innovative ways of working on the track that can keep to the disruption for our passengers to a minimum. During work on the track, NS does its best to arrange alternative transport for passengers. A landmark event will take place in spring 2017: Abellio will start operating its first cross-border franchise, from Arnhem to Düsseldorf and Mönchengladbach. 2017 will also be a tense year as we will find out whether we have won the West Midlands franchise in the United Kingdom and we will be submitting our bid for Wales & Borders. We will also continue further with the implementation of the ScotRail Improvement Plan and we will carry out all the preparations for the introduction of new rolling stock in Greater Anglia in 2018. NS expects to make a profit in 2017 as well. Bringing the costs down further will certainly be a challenge, as will increasing revenues, for instance from commercial operation of the main rail network. NS will also continue to invest heavily in programmes that help us achieve the KPIs, customer satisfaction, new rolling stock, cost control in the corporate staff functions and indirect costs, and in productivity. As a Dutch saying goes, you have to spend to make a profit. In 2016, the State Secretary of the Ministry of Infrastructure and the Environment announced an investigation into market regulation in the Dutch railways. The investigative committee established for this purpose will probably report on its conclusions in the second half of March 2017. NS is cooperating with this investigation by providing the necessary information and data. In the past year, NS and its partners GVB, RET, HTM and Qbuzz drew up a vision outlining the future for mobility. This vision for the future is based on the use of sustainable forms of different kinds of transport that fit in with the requirements of future passengers. Over the next few years, we will be working with our partners to see how we can flesh out this vision. Since 2016 NS has had a new strategy and a new structure at the most senior level. This lets us focus as a company on the midterm review in 2019, which will assess whether NS has achieved its goals. In 2017, NS will be starting an organisation-wide programme to encourage a culture of openness, taking responsibility and exemplary conduct throughout the organisation.